Did I say Grand Prix? Sorry, that probably should have been “Bland Prix”, or just “Prix”. 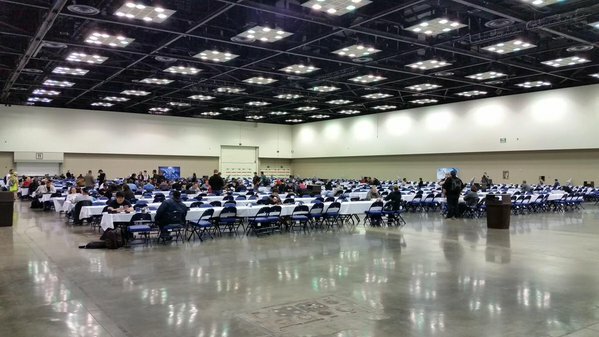 Indianapolis has a storied history of players just not showing up to Pastimes events and throwing yet another Grand Prix on yet another holiday weekend didn’t seem to alter any timelines. With less than 1100 players participating in the main event for a constructed tournament, we have to ask what’s wrong with this picture and is it significant going forward? The easiest thing to do is blame Pastimes. The hardest thing to do is narrow down a specific reason to blame Pastimes outside of the $70 entry fee to the main event. I thought long and hard this weekend about why exactly so many players in the Midwest hate Pastimes with an irrational passion and I honestly can’t put my finger on it. Their judge staff is basically interchangeable with the judge staff of any other event east of the Rocky Mountains…because it’s basically the same core of judges across many of these events. They hardly ever have to manually pair entire tournaments anymore, so that can’t be it. They even spread out prizes in Win-A-Box events to the top four players and there’s more than a box worth of prizes. It’s evident that they’re trying, even if that effort is only to line their own pockets. The most telling thing for me as an Indianapolis Magic player is that so few of the local players even attend home town events. It’s a Friday night and there are a million side events occurring at the Grand Prix and the local player base would rather attend an FNM, the baseline for Magic events. If a company is doing a decent job running Magic events, you’d expect to see local players showing up all weekend long, but you just don’t get that with Pastimes events in Indy. A non-zero amount of players didn’t play in the Grand Prix simply because it was a holiday weekend, but that’s no reason to see HALF the attendance you would expect for a city that only exists because it is at the nexus of every other major city in the Midwest. Add in a Regional Pro Tour Qualifier on Friday and you’ve got a recipe for what should be a decent turnout. We might have hit the breaking point for what players are willing to spend to play this game. There is a mile difference between a $50 entry fee and a $70 entry fee for the average player, you can almost justify playing a sub-optimal deck in a $50 tournament…you’re getting a sweet promo and a playmat out of the deal, but you can’t justify skimping on the Gideon, Ally of Zendikars and Jace, Vryn’s Prodigys when you’re shelling out $70 just to sit down. Add in a couple meals from Noodles & Company and parking and you’re at $100 for the weekend for one event when this was traditionally a failed attempt at a Grand Prix and a couple drafts or Win-A-Boxes. Unfortunately, we’re probably not going to get another US Standard Grand Prix before Oath of the Gatewatch to determine whether it’s card prices or the Tournament Organizer that stifled attendance but Grand Prix attendance will have an effect on card prices if it continues to fall. Big dumb Eldrazi won two out of the four events. If you had the the misfortune of attending Grand Prix Indy and took a look around at the room’s hot lists you’d also have noticed that there was some very small spreads on Ulamog, the Ceaseless Hunger and Ugin, the Spirit Dragon. Ulamog was selling for as low as $12 and appearing on buy lists as high as $9, a small spread like this is typically a sign that a card is getting ready to move. There were similar spreads around the room for Ugin, I found them for sale as low as $25 while appearing on buylists as high as $23. I’ll be the first to admit that the Eldrazi ramp deck is not optimized. When looking over lists to throw this deck together for my weekly local, I saw that there’s not consistent numbers on many of the cards. Some run Rattleclaw Mystic and others run Map the Wastes, some run four copies of Hedron Archive while others only run two. In the coming weeks we’ll see this archetype optimized and the deck steam lined and a more cohesive 75 presented. The deck battles extremely well against Dark Jeskai and may have been the foil that kept it out of the top eight. With a paltry four rounds of piloting it under my belt now it’s pretty easy to see that with a couple slots changed around, it can have a pretty decent match against most decks, thanks heavily to the low threat density in many of Standard’s most popular decks. As this deck continues to pick up steam (and seemingly gain more cards from Oath of the Gatewatch), I expect both Ulamog and Ugin to continue climbing. It appears that next spring Wizards is going to leverage one of the most popular planes of all time in an attempt to shift some of our excitement from fall to spring. What do we know so far? Nothing beyond a name, some twisty branches and a feather turning to blood: SPOOKY!!! You can read the set announcement here. The set is said to contain 297 cards which is up from the 274 that we saw in Battle for Zendikar, this likely means that they’re counting both sides of some flip cards as individual cards…so if you’re into that kind of thing, you’ll have that to look forward to. I wouldn’t place any bets on seeing a reprint of any Magic Origins planeswalkers, so you can throw that idea right out the window now to save discussion. For the past few years we’ve seen the spring edition of the duel deck series featuring planeswalkers. Many of us thought we were a lock for seeing Ugin vs. ______, but instead they decided to give us another deck introducing the block we’re about to visit and there’s a good chance that’s what we’re going to see this in duel decks for the foreseeable future as it makes for a more cohesive marketing strategy. Instead of Eldrazi, you can see that it’s just a lot of demons flying around causing a ruckus, a problem caused by Liliana destroying the Helvault the last time we visited Innistrad. Thanks Liliana. Ugin’s absence is another reason I think the card is a great pick up long term, as there’s no player in Magic that Ugin doesn’t appeal to, from the kitchen table to Commander to Modern to Standard…the card is just sweet. The new block structure makes it even harder to reprint a planeswalker with the Core Set option off the table, so it’s going to be much harder for Wizards to give us a reprint outside of a Modern Masters III. …or 2016, whatever they want to call it, is also in Spoiler Season starting this week. At this point we’re well past these decks being worth any money and while there’s probably one that you’ll be able to crack and make $5 selling off it’s contents, there’s little to get excited about financially other than the prospect that a number of your spec targets get reprinted into oblivion, totally ruining your profits – sorry bro. There’s still a possibility that these two color decks feature the enemy fetch lands, but Wizards is conscious about how much reprint equity they throw into their products and the fetches will sell a large set on their own, so there’s no reason to waste it on Commander decks. I’ll go more into depth on the price death spirals these decks initiate in the comings weeks as there’s not really a lot of say other than “hey this card is kinda neat” followed by ignoring it completely for two to three years. Print-on-demand prepackage singles are no longer hot investments. The Death of Legacy™ has been an ongoing #mtgfinance saga for a couple years now, and the Illuminati are trying their hardest to kill it off completely. SCG announced this week (in the middle of me writing this article) that they were changing the format of their open series to be a $20k tournament followed by two glorified side events on Sunday rather than two $5k events. Now Legacy players will show up to win sweet prize wall tickets that will be redeemable for mis-priced garbage that Legacy players probably don’t want to own. Most people were playing Legacy to play Legacy, not for the prizes. I’m not going to consider Legacy a great “investment” going forward as there’s better places to park your money, but it is still the best format in the game and almost anyone that’s played it will agree. I’m sure this is a topic we’ll cover in more depth as we see how this shakes out in the coming months, but I’d be remiss if I didn’t at least mention it here. While I generally have little trouble writing about what I want to write about (one of the benefits of being overly opinionated), I don’t always write about what YOU want to read about. So this is my call for questions you want answered or topics you want discussed in future columns. Leave your requests in the comments below and we’ll see what we can cover. I agree with your sentinments on CMDR15, I don’t anything from that set will be worth anything. Also I am pretty sure if they were going to put enemy fetchlands in the sets they would have spoiled them by now. Given the positive reactions to the new cards thus far I don’t expect any blockbuster reprints. …and 4x Tarmogoyf which with all honestly I may only buy 1-2 and not for now. When I started building a junk deck, I started with the mana base, followed by the expensive cards that are used in multiple decks, and that had low reprint risk (at the time). But this question could make for a good couple of articles. Using a proper analysis on competitive cards to determine when to buy them. heh. With “proper analysis” I meant analysis of historical trends, as opposed to random speculation. I’ll see what I can cook up, but deck building within historical trends is a hard proposal to line up exactly, especially when looking at Modern which is sent surging in spurts initiated by outside factors. I think Noble Hierarchs are probably your best target to pick up first, they’ll prove useful across multiple decks and they’re not going lower any time soon. I’d hold off on the Voice of Resurgence until after they announce the GP promo (or lack there of) as it’s one of the prime promo targets. Knight of the Reliquary is a good target to pick up sooner rather than later as every new “land matters” card makes this card more relevant. We already saw a recent uptick in KotR’s price thanks to Retreat to Coralhelm, Oath has a decent chance of introducing more cards that round out the archetype further. Eh, I stopped my protrader account when they started putting ads in EVERYTHING. The forums aren’t super-active, and while you’re missing out on some insightful comments, those comments are typically reflected in an article a few days before (or after). I don’t think that a larger number of cards in the set means they’re counting each side of a flip card – flip cards were numbered with sides ‘a’ and ‘b’, i.e. 231a/231b. Also, since we’re only getting two sets per block now, I imagine they’re throwing in a few more cards with each set. It’s entirely possible that I’m just wrong in my assumption and that they’ve changed the format of their print sheets and a new number of rares / uncommons will be seen in sets going forward. How do I go about reasonably acquiring 4 Tarmogoyfs? 6. there is no reasonable way! Can you talk more about legacy and modern? I am a non standard player because it’s a money pit and its feelings like that that make me check this site daily. Why is there so much flux with Legacy in the past year? It’s an eternal format but there seem to be more changes with it than Modern and Standard. Cruise was banned, Legacy was cut out of the Pro Tour (right? ), Star City restructured their Standard coverage and now show no Legacy on Sunday, Dig was banned, new SCG announcement. What the heck is going on and why is Legacy seeing such little love?? Do stores and organizers really just want to make money on sealed events, sealed product, and Standard events? Legacy was a labor of love, they’re still running it on Sundays at SCG events, it’s just not on camera and no longer a $5k event. Treasure Cruise and Dig Through Time were clear mistakes in the format and Legacy hasn’t been a Pro Tour format for a long long time. The reality is that Legacy cards are scarce, there’s a lot of overhead to even begin carrying them for your average retail store, and they just don’t move as fast. Part of Legacy’s decline has been Modern’s ascension…when you can do most of the same things for a fraction of the price it’s hard for many players to justify shelling out thousands of dollars for a format they’ll rarely play when they can shell out hundreds of dollars for a format they’ll play regularly.